There’s no other way of putting it – some players just have a natural instinct to know where the back of the net is. The Premier League has seen some great goalscorers in its time – Alan Shearer, Cristiano Ronaldo and Sergio Aguero to name three – but there’s a difference between being a great goalscorer and a naturally born finisher – a predator in and outside the box. It doesn’t really come down to any tangible quality, either – it’s not about being able to use both feet, or score long-range screamers, or have an incredibly accurate shot – sometimes it’s simply about being able to pop up, in the right spot, time and time again. The following five might not be the best pure goalscorers in Premier League history, but in terms of finishers, you won’t find any better. 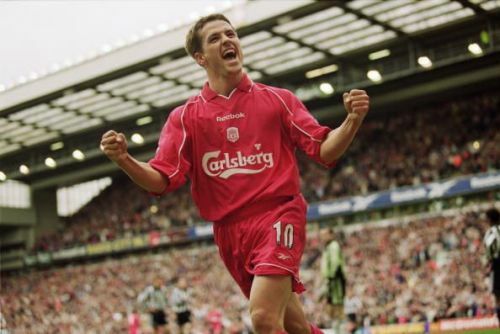 A natural born predator if there ever was one, Michael Owen is perhaps the best finisher ever produced in England in the Premier League era. The pint-sized striker scored goals for fun throughout his career as a schoolboy, and he didn’t slow down once he broke into Liverpool’s senior side in the late 1990’s, scoring his first goal in the 1996/97 season. It was 1997/98 that really saw Owen put himself on the map, though – using his blistering pace to outrun even the most experienced defenders, he scored 18 goals in the league to claim the Golden Boot. That summer saw him explode onto the international scene with his now-legendary solo goal against Argentina for England in the World Cup second round, too. Overall Owen scored more than 15 Premier League goals in all but one of his seasons for Liverpool, and even as his career began to tail off due to a series of bad injuries, he was still as deadly as ever – as he proved by scoring the winning goal for Manchester United in their famous 4-3 victory over rivals Manchester City in September 2009. It didn’t matter whether it was with his right foot, left foot, from close range or long range – or indeed, even with his head, rare for a short player – Owen simply knew exactly how to put the ball in the back of the net. He’s one of the most lethal finishers of all time.